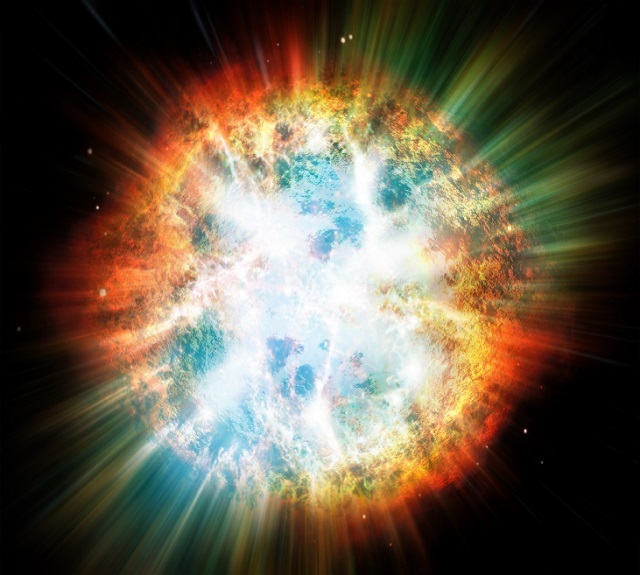 A supernova occurs when a star explodes and is one of the most energetic explosions in space. There are two processes that can trigger a supernova explosion. The first happens in a system of stars that orbit the same system (binary stars). In this case, accretion of material takes place, from one star to the other. Eventually, the star has too much matter and explodes, resulting in a supernova. The second process takes place at the end of the lifetime of a massive star. The star runs out of nuclear fuel and some of its mass flows into its core. The core cannot withstand its own gravitational force and collapses. In June 2015 astronomers, lead by Subo Dong, an astronomer at the Kavli Institute for Astronomy and Astrophysics at Peking University in Beijing, detected the brightest supernova that has ever been observed, known now as ASASSN-15lh. It is brighter than 570 billion Suns and 100 times brighter than ordinary supernovae. The astronomers that detected the explosion said that it probably belongs to a class of superluminous supernovae that are low in hydrogen. These explosions are thought to be fuelled by magnetars. The magnetar’s powerful magnetic field launces a wind that heats gas flying from the supernova. But ASASSN-15lh is hotter and more luminous than any other hydrogen-poor supernova. Also, the particular supernova seems to reside near the centre of a massive galaxy, whereas hydrogen poor supernovae live in dim dwarf galaxies. The team will now use the Hubble Space Telescope to further study the mysterious explosion and explain the physical mechanisms that triggered this massive blast. What ended the dark ages of the Universe?